This incredible hiatus from reality is evident in other areas of the NEA such as the fact that the publishers of NEA Today’s Winter 2016 issue think that no one sees through their bait-and-switch tactics. The corresponding article to the front cover is Good News! They are Reading! found on page 38. Page 39 is a full page color photo of a high school black male success story with a corresponding sub article, Improving Reading Outcomes for Young Black Males, so why does the magazine’s cover photo portray an elementary age white female child? This current issue (Here) is shot through with articles on racism and the stereotyping of students of color so a cover picture of an elementary age white female student is peculiar unless, of course, it’s a subliminal message of NEA’s transgender agenda. The key word in the article’s page 38 title is They and the bait-and-switch of course is to get one away from thinking about stereotyping students of color to stereotyping other categories of students. But elementary age white female students are hardly a group to be stereotyped so what is the importance of the child in the cover photo? For proof that the NEA is in a closely intertwined relationship with the transgender agenda their own website substantiates that fact. (Here) By searching transgender students 478 articles appear which should be enough to legitimately ask questions concerning the cover photo’s significance. The point is -- Is the child so prominently featured on NEA Today’s Winter 2016 cover a gender non-conforming child? That is -- Is the child really a girl, or is the child a boy dressed like a girl, meaning a biological boy self-identifying as a girl? Does the cover photo convey the message that They also includes transgender children and that the child pictured in the cover photo is a transgender child? It’s confusing. What was once so easy isn't any more because of insidious agendas from organizations like the NEA. Girl or boy? Boy or girl? 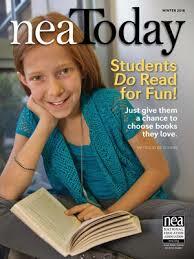 Is this NEA Today cover a subliminal message promoting the NEA's "diversity" agenda? What do you think? For some reason, I'm not seeing this on any of the Catholic blogs I frequent. Seems to be verified as actually happened...not just a rumor. The educational system was one of the first targets for the communist infiltration and destruction of America. Recall Bella Dodd was recruited into CPUSA while a Professor at Hunter Teacher's College in NY?
" Mr. MORRIS. Did something take place in 1935 that brought you closer to the Communist Party? Is that what you indicate when you give the terminus of that date? Mrs. DODD. Yes. In 1935, the Teachers' Union was having a great deal of difficulty because of the so-called Communist and anti-Communist factions within the union. I n 1935, or the beginning of 1936, one part of the union left the Teachers' Union. This group of 700 teachers was led by Dr. Linville and Dr. Lefkowitz. They left and formed what was called the Teachers Guild, and the remaining 1,500 teachers who remained within the Teachers' Union were the union. Now, while they had 1,500 teachers, the seasoned leaders of the union had, gone with the opposition, had gone out of the union. " " Mr. MORRIS. Now, Dr. Dodd, during that period, did you deal with Communist Party officials, and were you connected with that work? Mr. MORRIS. Will you tell us what relationship you bore to the Communist Party organization while you were the legislative representative for the Teachers' Union? Mrs. DODD. Well, I soon got to know the majority of the people in the top leadership of the Teachers' Union were Communists, or, at least, were influenced by the Communist organization in the city. Mr. MORRIS. Will you tell us precisely how you knew that, Dr. Dodd? Mr. MORRIS. This is now from 1936 to 1944; is that right, Dr. Dodd?